Doobert & Hurricane Harvey – What can you do? Home arrow_forwardThe Doobert Caretakerarrow_forwardDoobert & Hurricane Harvey – What can you do? 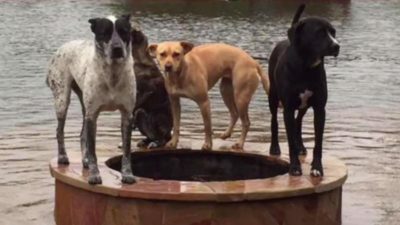 As you might imagine, there are a lot of people wanting to help with the Hurricane Harvey response, particularly to help animals in addition to the people. I’ve been getting emails for the last week asking when Doobert will post transports from Harvey, and what can people do to adopt, transport, foster or in some way help the people and animals of Texas. There are all sorts of people and groups posting on social media that they are headed to Texas and many boasting about the great work they are doing. The hardest thing as a passionate animal lover to do right now is to be patient, and wait, yet that is the most prudent response to the situation at this particular moment. I have personally been in contact with the emergency response teams from the ASPCA, Humane Society of the US, Best Friends, and the Greater Good.org. They are trying to coordinate their teams with the various government and other crisis management teams, and trying to manage the onslaught of groups and people just rushing in to help without a plan. One of the best things these large organizations bring to natural disasters is the management and governance to do things in an organized fashion so as not to create secondary problems. They have the communications, resources, and leadership necessary to organize the response and communicate with one another as well as the other agencies involved. Yes, Texas had and still has an overpopulation problem for companion animals. Yes the Hurricane caused problems for animals in addition to people. And yes the shelters, rescue groups and law enforcement teams were proactively trying to move animals out of the impact zone. But now with the rush to help they are facing a secondary problem; well-intentioned people and organizations removing people’s pets that they found, or moving animals that do not have the appropriate health checks and vaccinations for where they are going. This has potential disastrous consequences not only for the people and animals involved, but also for us as an industry. I’ve blogged before about the importance of not letting one’s passion be an excuse to work around best practices and laws. In fact, one of the reasons I spent the time researching the laws in each state was to provide it as a resource to all of you so that you could make sure WE as the rescue industry are setting good practices by adhering to the rules and regulations established. 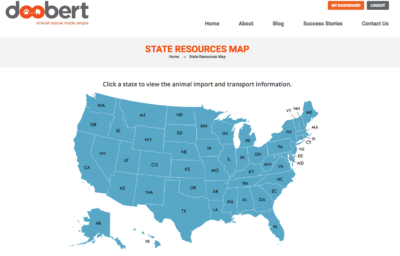 (https://www.doobert.com/state-resources-map/). Many of the state laws that are on the books were implemented with emergency legislation from state veterinarians due to natural disasters. Legislation like the one in Massachusetts was enacted through emergency session and continues to exist as one of the most stringent in the country. Please know that I am continuing to work with organizations of all shapes and sizes to be a part of the coordinated response to Hurricane Harvey. We know this will not be the last storm that will cause devastation in the U.S. In addition to being responsive to this situation, we also need to use it as an opportunity to better our practices, hold the line on the RIGHT way to transport animals safely and effectively, and to not cause secondary problems that require even more effort to clean up. You have my word that when the volunteer rescue relay transport community on Doobert is needed, that I will urgently notify all of you with specifically how you can help. In the meantime, please help by encouraging others to take a measured approach and not inundate the Houston area with uncoordinated help and resources that while well-intentioned, could inadvertently cause additional problems. You made some valid and important points on following the rules when it comes to wanting to help out with rescues and transports in these situations. Thank you Chris, and to everyone else who works and volunteers at Doobert. I am proud to be a volunteer in your organization. Great words and thoughts, Chris! At this point, I feel rather helpless, but I did make a donation to ASPCA for their rescue efforts in the thick of things. Hopefully, it will help.